Interfolio is an ORCID Member Organization. ORCID’s vision is a world where all who participate in research, scholarship, and innovation are uniquely identified and connected with their contributions and affiliations across disciplines, borders, and time. ORCID is an open, not-for-profit organization that serves the research community by collaborating and innovating with organizations like Interfolio. They provide individuals with a unique identifier, an ORCID iD, that reliably and clearly connects them with their research contributions and affiliations. The ORCID record focuses on faculty scholarship and consolidates scholarly works from many online sources. This makes the Faculty180 – ORCID integration a powerful resource for many faculty, for loading their scholarship into Faculty180. Similarly, since Faculty180 holds many types of activities that are not commonly cataloged in online databases (e.g.presentations, posters, etc) using the facility to export to ORCID can be a great tool for expanding and enriching a researcher’s ORCID record. In addition to research and scholarly works an ORCID record can hold: work experience, education and training, grants, and a biography. All of these additional materials can also be exchanged from the corresponding Faculty180 sections. 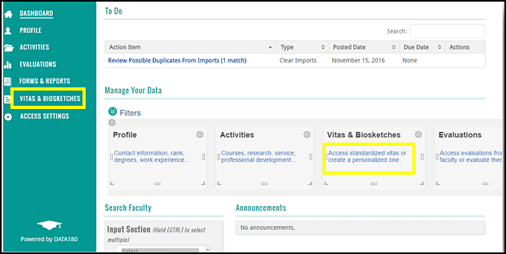 In Faculty180 access to the ORCID functionality, if it is turned on for your institution, is available in the “Vitas and Biosketches” menu; and further details can be found by searching the Faculty180 help system for “ORCID”. If your institution wishes to utilize the ORCID integration, please submit a Support Ticket requesting that access to the ORCID API be turned on. Once the request is received, Interfolio will need to confirm the mapping of the ORCID profile data for your institution's customized database. Navigate to Vitas and Biosketches by either clicking the link titled Vitas & Biosketches on the menu located on the left of the screen, or click the link for Vitas & Biosketches under the Manage Your Data section on the Dashboard. Under the 'Vita/Profile Systems' heading there will be an entry for ORCID Registry. The faculty member must sign in to their ORCID account from here by clicking the link titled 'Create or Connect your ORCID iD'. Clicking the link takes the faculty member to the ORCID website. Either create an account or use an existing account, and click the Authorize button. Upon successfully logging into ORCID and authorizing access, you are returned to FACULTY180, and a message displays indicating 'Access successfully granted'. The faculty member's ORCID ID displays in the View Profile column. Clicking the ORCID ID link takes the faculty member to their public ORCID profile. Clicking the ORCID Registry link will take the faculty member to the ORCID homepage. Biography: the Biography field maps to Biography. Note: Biography is the only field that maps in this section. Log in to FACULTY180. If access has not already been granted to the ORCID account, follow the steps outlined to 'Grant FACULTY180 Access to a Faculty ORCID Profile'. Navigate to Vitas and Biosketches (either from the menu or under the 'Manage Your Data' section of the Dashboard). Click the Import button under 'Vita / Profile Systems'. Data from the ORCID profile displays. Select items that you wish to transfer to FACULTY180. Note: Duplicate (previously imported) entries are hidden, and thus will not display. Once all the desired records are selected, scroll down and click the Import Selected button. The records to be imported display. Update the status and Semester and Year, as needed. Then, click the Save button. Possible Duplicate: possible duplicates can be reviewed under the To Do section of the Dashboard. Exact duplicate: will not be imported. Click Go Back to return to the Vitas & Biosketches page. To review the import results again, click the View link under the View Previous Import column. The ORCID Export feature is currently not available. Log in to FACULTY180. 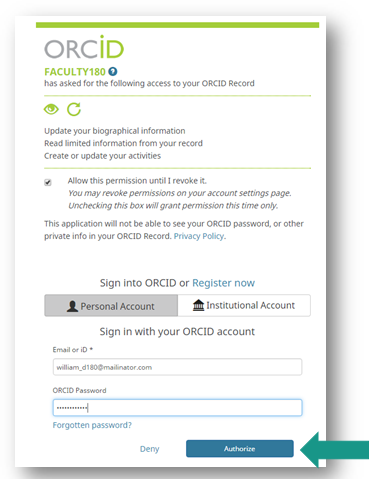 If access has not already been granted to the ORCID account, follow the steps outlined to 'Grant Access to ORCID'. Click the Export button under 'Vita / Profile Systems'. A message displays indicating the data is being exported. The message disappears once the export is complete. To view the results of the export, click the View link under the View Previous Export column. Note: only errors will be displayed. Under the 'Vita / Profile Systems' heading, the entry for ORCID Registry will show the faculty member is signed in. Click the check mark next to 'Signed in' to revoke this access. A dialog box displays, prompting for confirmation. Click Confirm. The access has been revoked. Access will need to be revoked within ORCID as well to prevent FACULTY180 from accessing the users' account. To revoke access to FACULTY180 from within ORCID, log into your ORCID account and go to 'Account Settings' under 'For Researchers'. Under 'Trusted Organizations' click the trash can icon next to the 'FACULTY180' organization. Click 'Remove as trusted organization'. FACULTY180 will no longer have access to your ORCID account until you choose to grant access to FACULTY180 again. 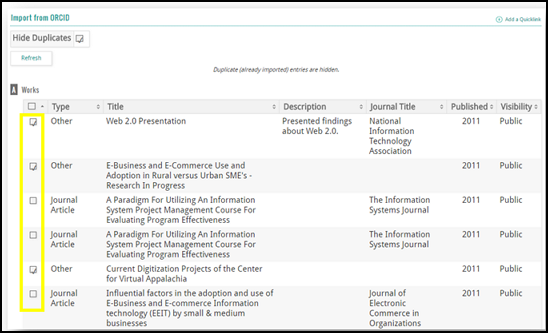 We offer a non-mandatory "Interfolio Suggested Mapping" of scholarly contributions subtypes in Column B. No action required here. If you want a different mapping from what is indicated in B, feel free to add the name of the scholarly subtype (e.g., "Book") into Column C. If you leave C blank, we will assume the mapping in B is your preference. Action potentially required here. 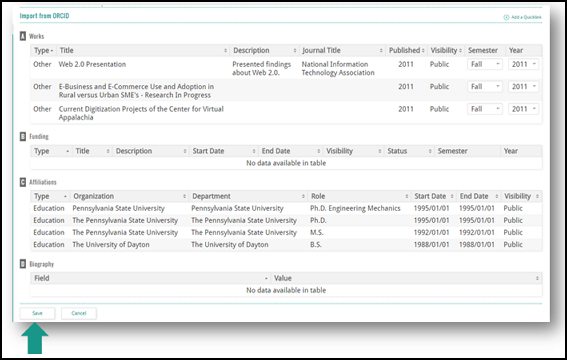 The section named "FOR REFERENCE ONLY" gives you an idea of how F180 and ORCID map at the field level. As you can see, certain ORCID fields don't map to F180 and vice versa. No action required here. Feel free to return the marked-up spreadsheet and we'll get your re-mapping squared away. If you would like to get further assistance using the ORCID integration within Interfolio, you can contact help@interfolio.com, or you can contact ORCID directly at their website for ORCID specific questions.